Age Limit: Candidates upper age should be in between 18 to 27 as on 01-07-2016 for General candidates. Age relaxation is 5 years for SC/ ST and 3 years for OBC candidates as per rules. Educational Qualification: Candidates should possess Full Time Diploma in Chemical Engineering/Technology from a Government Polytechnic or equivalent Government recognized Institute of repute with First Class, minimum of one year of experience in Oil Refining / Petroleum / Petrochemical / Chemical / Fertilizer industry etc. in a Factory / Manufacturing Unit of Repute. How to Apply: Eligible candidates can apply Online through the website www.bharatpetroleum.com from 30-07-2016 to 14-08-2016. 1. Before applying Online applicants should have valid email id &Contact No. 3. Go to Careers & Click on Current Openings. 6. Take print out of application form for future use. Starting Date for Online Application: 30-07-2016. 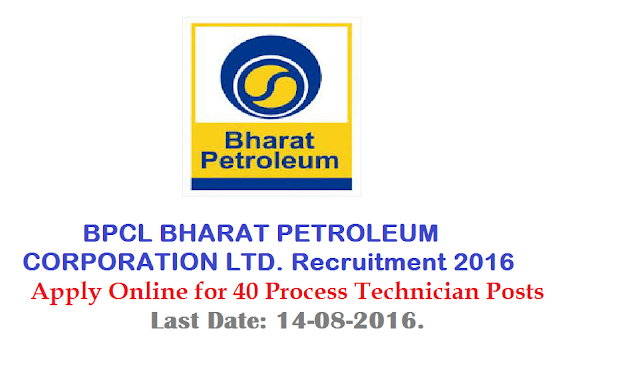 Last Date to Online Application: 14-08-2016.